Capt. Kenneth Sprague of Urbana salutes the American Flag during the playing of the National Anthem during the Illinois Army National Guard’s 3637th Support Maintenance Company deployment, Sept. 24. SPRINGFIELD, IL (09/24/2017) (readMedia)-- Approximately 800 people crowded into the LRS Hanger of the Springfield Capital Airport to see off about 135 Illinois Army National Guard Soldiers who will deploy to Kuwait. The deployment ceremony for the 3637th Support Maintenance Company based in Springfield, Illinois, took place on Sunday, Sept. 24. 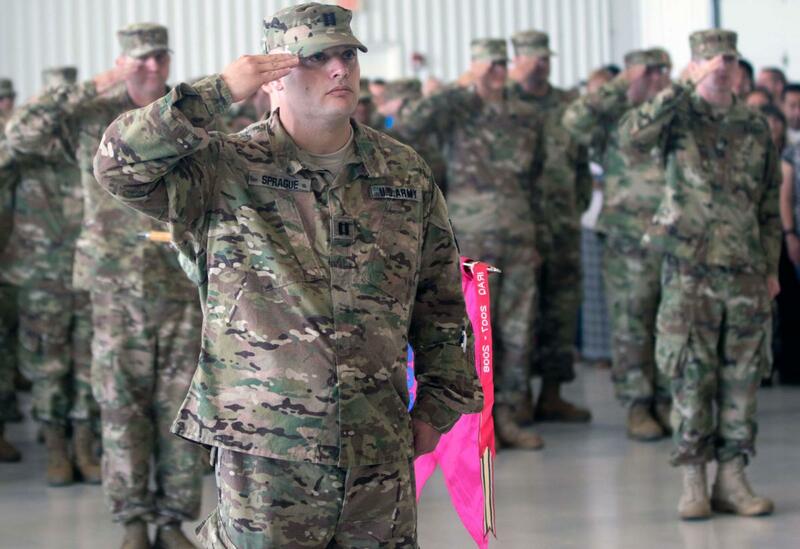 Following the ceremony, the Soldiers boarded an aircraft and departed for Fort Hood, Texas where they will train for a brief time, before deploying in support of Operation Enduring Freedom and Spartan Shield. "The 3637th has a long-standing history of awards and maintenance excellence," said Capt. Kenneth Sprague of Urbana, Illinois, commander for the 3637th. "In addition, we have pulled together some of the best Soldiers in the state and have become a family." The company will be responsible for maintenance and support to nearly 40 units deployed to the region. "Our Soldiers continue to train and deploy to the Middle East to ensure our country is safe from terrorism," said Maj. Gen. Richard Hayes, the Adjutant General of the Illinois National Guard. "Many of these Soldiers have put their family life on hold and deployed multiple times to the Central Command region." The unit is expected to be deployed for approximately 10 months, returning during summer 2018. This is the largest single unit deployment of Illinois Army National Guard Soldiers in three years.